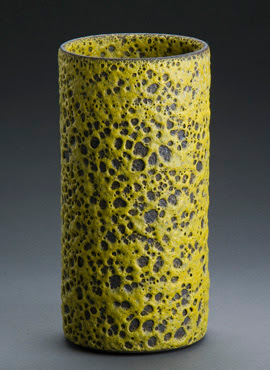 I am excited to say that I know contemporary ceramicist Josh Herman from high school. 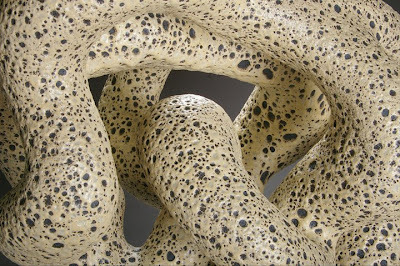 Now, Josh is best known for inventing dynamic sculptures with glazes resembling geologic textures. 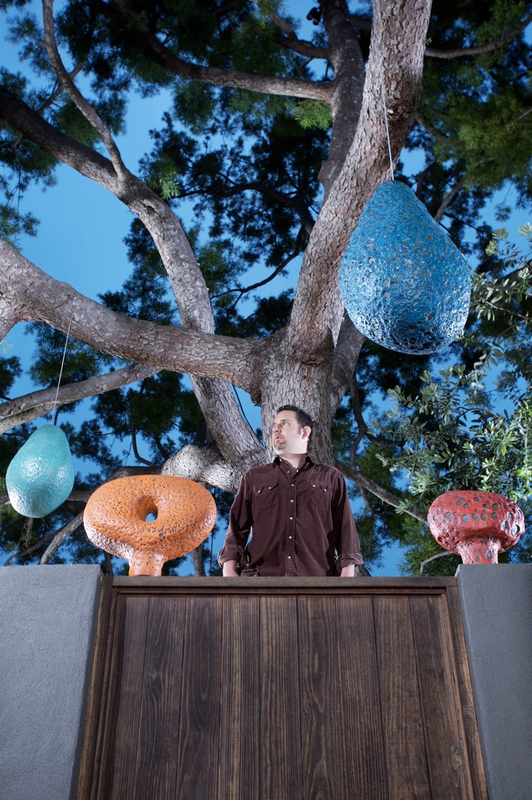 It took him seven years of glazing experimentation to master this innovative glazing technique. 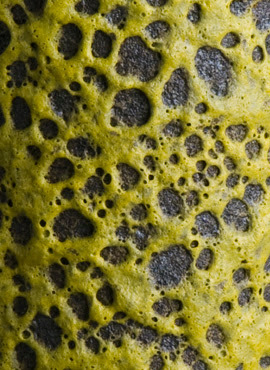 Take a closer look, the colors and textures are incredibly beautiful! He worked hard to get them just right! 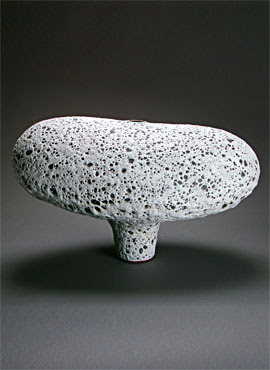 His organic and sensual forms are pocketed with craters, almost meteoric. 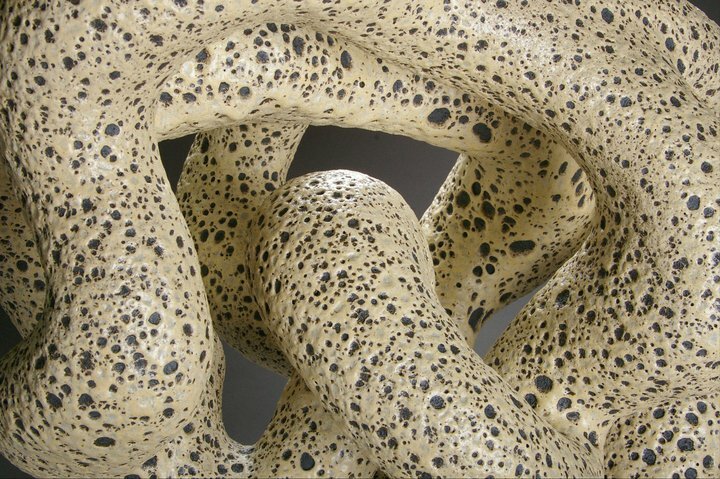 His fascination with nature and exploration of texture produces one-of-a-kind sculptures that stir one’s emotions. He wants his viewer to feel something rather than contemplate. Josh himself is very connected to his pieces. 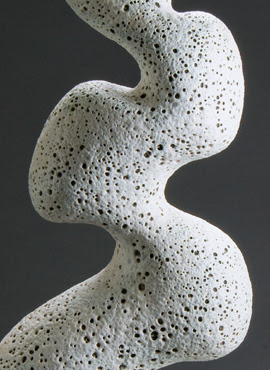 He learned and now applies a mindfulness-based method called Hakomi which ultimately grounds him to be mindful and connected to his experience of making and sculpting. 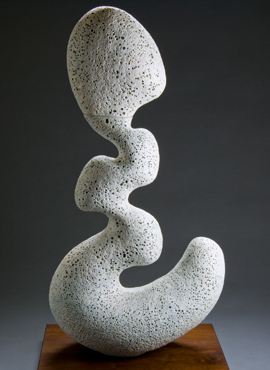 See Growth, one of his newest works that he terms "dynamic movement." Don't you just want to shrink down and crawl inside one of these pockets of space? What influenced your evolution as a sculptor? After walking away from ceramics around age 25, I got into doing a lot of therapy, really looking deep into myself. It really changed me for the better. During that time, I learned a mindfulness-based method called Hakomi which influenced me in many positive ways. 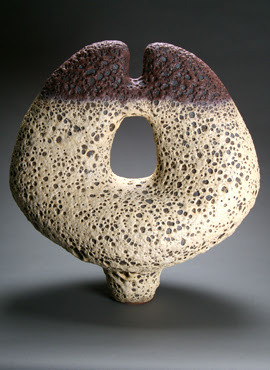 When I came back to clay at age 35, I was an entirely new person. My art changed profoundly. I had more conscious connection to myself and to my work and I had learned to utilize my present experience as a resource for creativity. Having that skill really propelled me forward as an artist and gave me a foundation for continued growth. Can you elaborate your process-oriented approach of letting your pieces organically unfold while balancing Hakomi, the Eastern principle of mindfulness and unity? In Hakomi, we use mindfulness as a way of studying self. That means that we use the "in the moment" experience to get to the deeper core levels of what we believe and feel about ourselves and the world. In making abstract work, there are decisions to make constantly. "Shall I go this way or that way with this form?" To answer those questions you are required to be sensitive to yourself. "What seems right? What is attracting me?" So to work organically without the finished piece in mind, you must be very connected to yourself. And I have to be connected to the piece; as I work, the piece unfolds. I do not know where it’s going but there is a vocabulary, a world that unfolds in front of me as the piece grows. I use that information to go forward--it's like being absorbed into the world of the sculpture and feeling around in that world. So I pay attention to the growing piece as well as my impulses and my feelings. 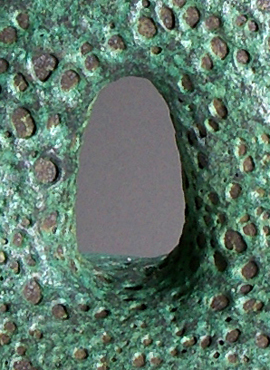 The resulting work is a combination of the language of the material and my subconscious. Sometimes, I hear surfers talk about connecting to nature in a profound way when they ride waves. I feel the same way except it might take me weeks or months to work through the process of a piece. It's a pretty all-encompassing experience to make work this way. I think about the pieces all the time. But when it's done, and the piece works it is an exhilarating feeling. A form is born that I had could have never thought of consciously. It’s bigger than me in that way. I love that I do not know what is going to happen. It’s an incredible process. How would you describe your artistic style and what are you trying to communicate through your sculptures? There is nothing specific I am trying to communicate; when I work, I try to go inside and bring forth forms that excite me and elicit emotions. For viewers, I want my work to have an emotional impact. When someone sees my sculpture for the first time, I want them to really feel something. That response is different for everyone but people do respond. An older fellow came up to me at an exhibition and commented, "how did you get so sensual?" I loved that. He connected with the sensuality of the sculpture. I do not want my work push people to start thinking; I feel that in our culture we are too much about thinking and not enough about being and feeling. We are too disconnected from our experience and identify too fully with intellectual thought in art. I stay away from the conceptual and focus on the expressionistic. Do you draw inspiration from nature? What in life inspires your art? There are a lot of things that I love and contribute to/inspire the work. I have always been drawn to the shapes of trees. The branching pattern of trees is so dynamic and yet ordered. It turns out that trees and all of nature follow a mathematical concept called fractals. It’s an underlying structure that encompasses the seeming randomness of nature. I try to utilize the principles of fractals in my work. I particularly enjoy succulents. I have a large succulent garden in front of my home that is continually inspirational. 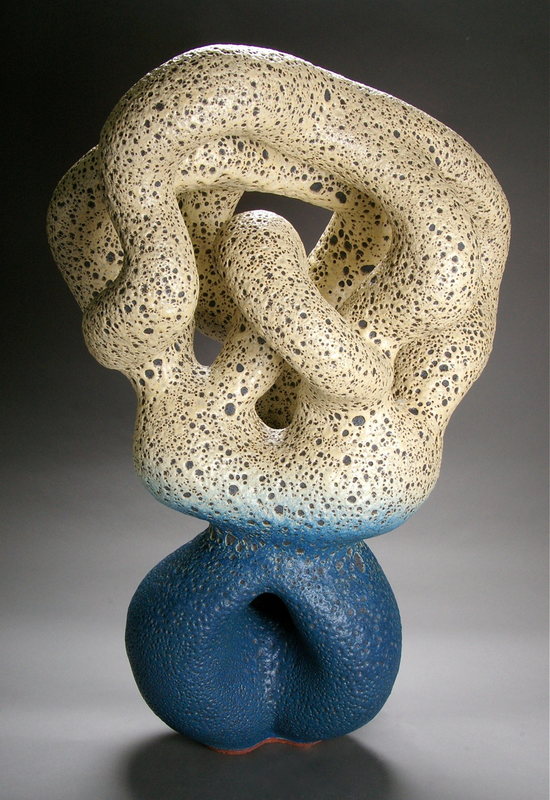 The forms are incredibly sculptural and the colors are so varied. I look at that garden every day. (See pic above). I also love music and especially connect to Jazz and improvisation. The musicians translate their inner experience into sound and they do it spontaneously. It's from their heart and not from the intellect. I really connect with that aspect—my work is coming from my heart and not my head. 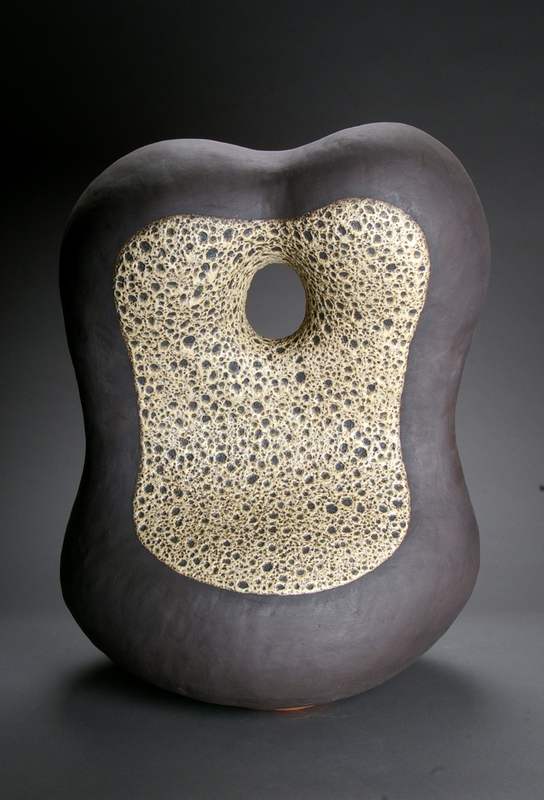 What gave you the idea to apply a volcanic effect onto sensuously natural shapes? I discovered that my work was "Modern" about 7 years ago. I did not even know what that meant but I knew that I liked modern design. 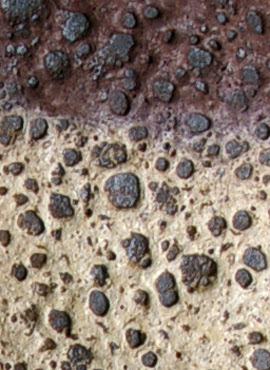 My friend Bryan Forward suggested that I check out Otto Natzler's work and his use of volcanic texture glazes. I loved the dynamic, organic quality of Natzler's glazes. So I decided to give it a shot. There were not many volcanic formulas out there to try so I had to figure it out from scratch. I started researching glazing and began running lots of tests. It has taken me over 7 years to get the glaze I have now and I am pretty happy them. The glaze fits the pieces and activates them. I also love the earthy yet vibrant colors. 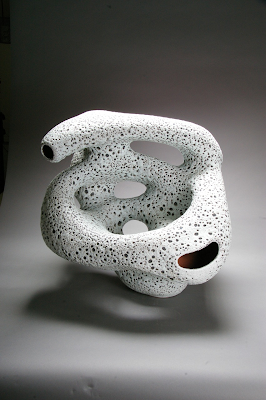 How do you manage the challenge of gravity while sculpting your organic pieces? 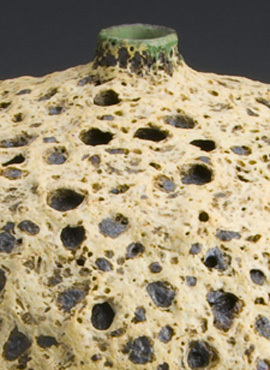 Clay has lots of limitations and is a difficult material to work with. It shrinks as it dries, it cracks easily and it sags when you fire it. When I am constructing, the clay is moist and it does not have the strength to stand on its own. So I have to build a little at a time. As the clay dries and firms up I can add more to it. But it has a rhythm. The timing can be manipulated with the use of water, plastic sheeting and torches but a ceramic sculptor needs to pay close attention to how the clay dries. 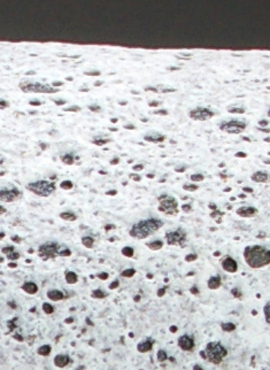 It is another layer of the process that makes clay so unique. How does this sculpture not topple over? Just uh-mazing! Do you have a favorite artist, writer, or music that has influenced your work? Some of the artists that I love are Henry Moore, Isamu Noguchi, Barbara Hepworth, Peter Volkous, Paul Soldner (my teacher) and Constantine Brancusi. I love the abstractions of all these artists. To make abstract work, the artist needs to go inside to find the forms, the shapes and the feelings. I love that about all these artists. When you look at their work, it’s like looking at a piece of their soul. Which forms and designs are you most proud of and why? I like lots of my forms! That’s why I make them. 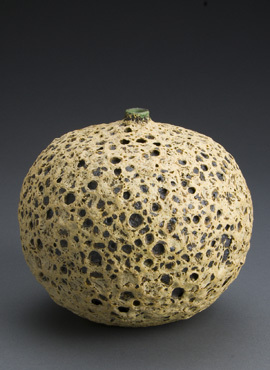 I love the pods; I love how they are so sculptural and yet are still pots. I also really respond to the canoe chalices. Those chalices are so dramatic and I dig the associations to canoes. I have always been fascinated by the apple bottles too. 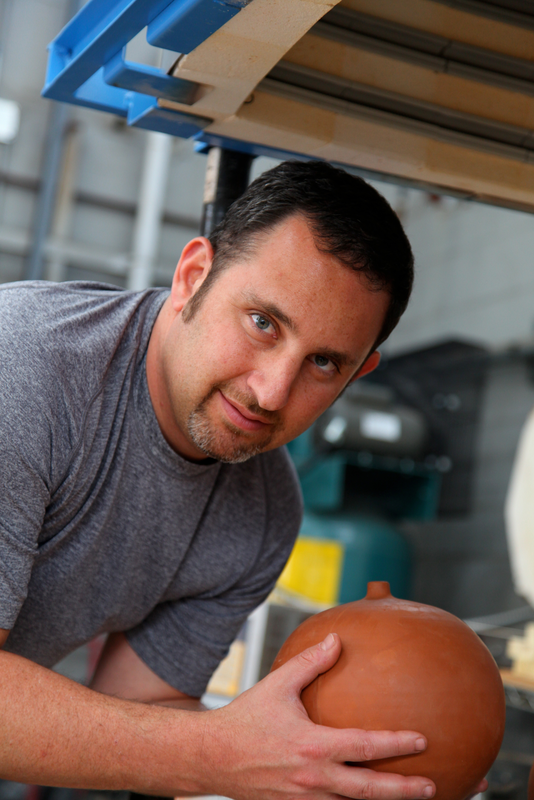 When I was learning to throw, a grad student made a closed neck bottle and I was so impressed. "How did you do that?" I asked him. Since then, I have been practicing making closed neck bottles and to this day, get a real kick out of closing up the neck to a tiny small opening. I just love making them. Currently, I am ramping up to make a larger body of sculptures for a solo exhibition. That should be something. I am very excited about doing the project because I have been so busy focused on production that I have not been able to make sculptures for some time. When did you start your business and where do you see your business going? I have been making clay objects for over 20 years now but the business aspect started in earnest about 2 years ago. I found a suitable warehouse to house the studio and that was the start. I had looked for over 3 years before we found our spot. Once I got the space I was able work on scaling the process so that I could produce larger amounts of work. So I think it was when we got the studio in that the business was really underway. That was almost exactly 2 years ago, and now the possibilities are unlimited. We have entered into a relationship with Design Within Reach, which is exciting. I want to continue to build relationships with appropriate design shops across the country. And now I can focus more of my energy in developing new designs as well as my sculptures. My passion and ability really lie in sculptures. The brand recognition I receive through selling pottery on the national level will only help the values and desirability of my sculptures. We anticipate a relatively steep growth curve. What are your plans for the future and beyond? That's a great question. I try to be open and hold any plans loosely. 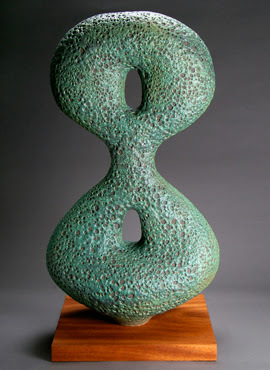 But I want to continue to work sculpturally. To me, that is where my passion lies. 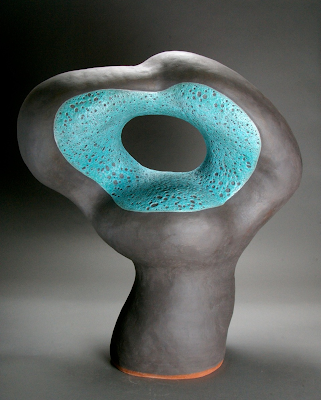 I enjoy making pottery too but the sculpture is what really excites me. 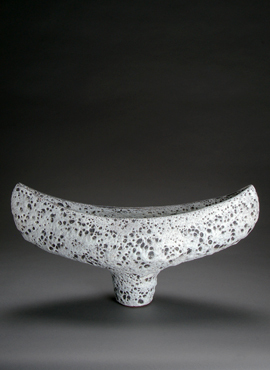 I want to continue to create new pottery forms too. We are refining our production process at the studio and want to expand the production line. We will continue to grow our brand recognition on a national level. The commercial success of the work is pretty important to me. I struggled with production and whether it compromised my integrity but finally realized that it freed me to be profitable and focus on developing a stronger sculptural line. Thankyou Josh for an amazing interview! You are a true innovator. I have no doubt we will see big things happen. Click 'LIKE' on my Fanpage.